Are you intrigued by resistance bands and how to add them into your yoga practice? Do you feel like the yoga postures aren’t keeping you as strong as you need to be to stay pain free? The Yoga with Resistance Bands Teacher Training is designed to provide you with the practice and teaching know-how to incorporate resistance bands into a yoga practice and build strength progressively. Resistance bands are an accessible and effective strength-building tool to incorporate in group settings, private sessions or your personal practice. You do not need to be a teacher to benefit from the skills and knowledge imparted in this training, although previous yoga, Pilates or dance practice experience is recommended. The constant tensile feedback from a resistance band means as we move against it, our nervous system gets more feedback. We get stronger, but better, our nervous system learns more and our motor control improves. Improved motor control is a proven way to decrease pain. Learn four class sequences themed around a pose category – standing poses, backbends, inversions, arm balances. All poses within the sequences will incorporate one or more resistance bands. Learn the logistics of incorporating resistance bands in group classes and master how to introduce them skillfully to students of varying levels of strength and ability. Change pose orientation to regress, progress or work new avenues of strength within poses and exercises. Change the body’s lever length to progress and regress the demands of an exercise or pose. Adequately prepare the body for whole task exercises by deconstructing the exercise into part task skills. Understand how the resistance bands act as ‘external ligaments’ to provide either resistance or assistance depending on the muscles targeted in the movement and the body’s relationship to gravity. Study relevant anatomy and biomechanics principles as a means to better skillfully apply the addition of resistance bands to meet individual students’ needs. Learn how resistance bands can provide joint tractioning for improved joint congruency (aka “bony fit”) during movement. Understand how resistance bands can provide joint approximation (joint surface compression) for enhanced proprioception (felt awareness of position in space) globally as well as at individual joints. 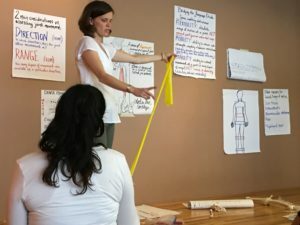 Experience and apply incorporating resistance bands to provide global feedback to the body for improved coordination of complex movement patterns, as well as enhanced motor control and balance. Get ready to dose your yoga practice with some serious strength! Feel stronger in your body. Inspire your creativity to innovate your practice and teaching. And experience old poses like new again! Finally, prepare to share this newfound inspiration with your students!